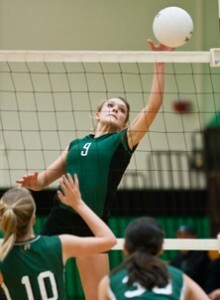 Marina Rose has been a standout for the Coventry volleyball team. File photo by Ken Rutt. Coventry High battled through a difficult season in 2011. The girls volleyball team had to overcome the loss of the program’s founder and head coach, Matt Hurlock, who died in July 2011, the appointment of a new head coach and the relative inexperience of a talented yet young lineup. Still, under new coach Ryan Giberson, Coventry won its sixth consecutive CIAC Class S championship and eighth in nine years with a perfect 24-0 record, its second straight 24-win undefeated season. In addition, the Patriots were voted the No. 1 team in the state coaches poll for the second year in a row. Quite an accomplishment for a Class S school.